But I removed the Facebook and Twitter apps and moved the mail app to the second page. When I open my phone, one of the only app icons I click is Instagram. Why Instagram? Because it’s a selective feed of photos of friends, family, beautiful people, cars, landscapes, and more. I can’t remember the last time something showed up in my Instagram feed that was negative. I’m trying this out. Removing Facebook is not an issue, but the only time I would check twitter was on the phone. I also changed about 70% of my home screen. I moved my email app to the second page, buried in a Work bucket with the rest of my work apps minus one – Slack. 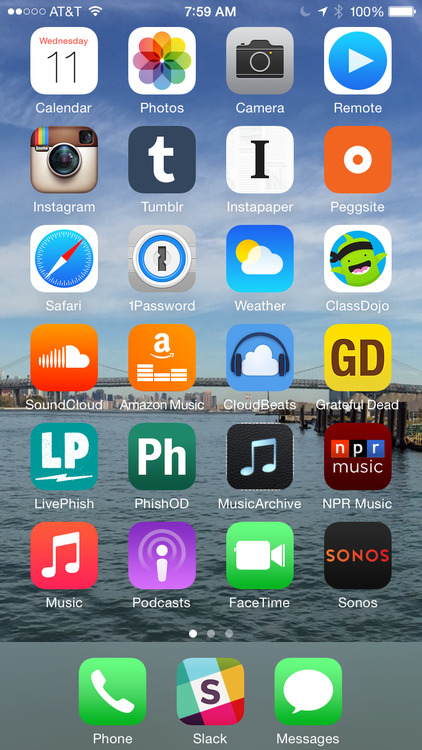 I then placed all of my music apps on the home page. Some I use everyday (Sonos). Other I use once a month. Regardless, the goal is to listen to more music and make that a primary use case of my phone instead of work.